(STOTS) - On Friday, January 18th 2019, Saint Tikhon’s seminarians and community members gathered around His Beatitude, Metropolitan Tikhon, for the Annual March for Life in Washington DC. This year’s March marks 46 years since the Roe v. Wade decision, when the United States Supreme Court legalized abortion. St. Tikhon's Seminary was well-represented during the March. Archbishop Michael, Seminary Rector, and Archpriest John Parker, Seminary Dean, were among those who stood stalwart behind His Beatitude as he offered a Panikhida for the holy infants slain by abortion. Fr. Ignatius Gauvain, Director of Student Life, organized the arrival of over twenty-five St. Tikhon’s seminarians and community children. Hieromonk Herman (Majkrzak) and seminarian James Latimer (STOTS ‘20) led the seminarian choir during the prayer service. 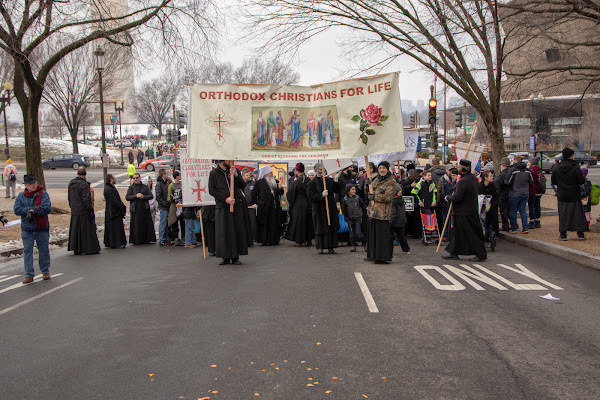 St. Vladimir’s seminarians and several local Orthodox clergy and parishioners were also among the Orthodox Christians who marched down Constitution Avenue chanting hymns and akathists for the life of the unborn, and their mothers and families. The Most Reverend Melchisedek, Archbishop of Pittsburgh and Western Pennsylvania, His Grace the Right Reverend Thomas of the Antiochian Diocese of Oakland, Charleston and the Mid-Atlantic, and The Right Reverend Daniel, Bishop of Santa Rosa, Auxiliary Bishop of the OCA Diocese of the West were among the Orthodox hierarchs present. 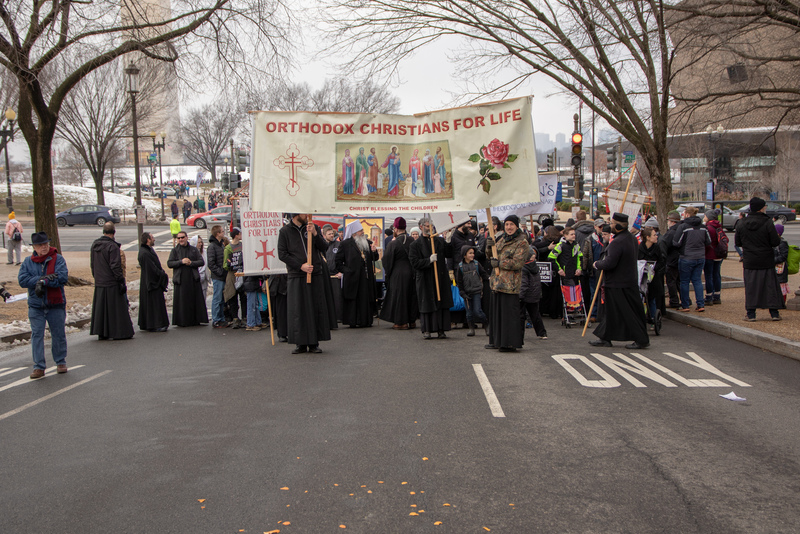 Seminarian Olivia Insignares (STOTS ‘21) professed the Orthodox Church’s presence at the March as a witness to Christ’s paschal victory over death. A seminarian wife of St. Vladimir’s Seminary considered her presence at the March for Life as a simple witness to Christ’s Commandments in a world which protects the slaying of infants who cannot protect themselves. Father Joseph Sharman (STOTS ‘19), Student Government President, believed the entire gathering of the Orthodox Church and seminarians at the March scattered hope in the wake of sorrow. St. Tikhon’s Seminary and Monastery continues to pray for the life of all, the unborn and the born, in the daily Divine Liturgy. Metropolitan Tikhon’s Archpastoral Message for Sanctity of Life Sunday (January 20, 2019) can be found here.